There is nothing more enjoyable than hopping out on a bike and riding with gorgeous blue skies and the warmth of the sun beating down on you. Unfortunately, we are not always that lucky! Riding in the rain is part of the life of a bike rider, and while it is not ideal, it is something that definitely shouldn’t be avoided. There are a range of steps that can be taken to make rides in the wet manageable, and even enjoyable. Staying comfortable when riding is one of the most important things that a bike rider must consider, and this is even more crucial in the rain. Waterproof jackets and pants are perfect for keeping the main parts of your body dry. Gloves are important for maintaining a controlled grip of the bike. Other items, such as overshoes, cycling eyewear and a mudguard are also great to have on those wet days! Rain often brings darker, gloomier days which make it harder for cyclists to be seen. Wearing hi visibility clothing and equipment is key, and goes hand in hand with being comfortable on a bike. Stores such as monkeysee produce accessories that help cyclists stand out, with a focus on being safe while looking great at the same time! Keeping your lights turned on is an easy way to be visible on a bike. While we know that the rain will make the surfaces we ride on slippery, we often don’t fully respect how different the conditions can be. Wet surfaces mean it’s harder for tyres to grip - riders should take caution and slow down where possible. Braking earlier is also something that should be considered. Lane markings on roads and cycleways can be like riding on ice when wet. 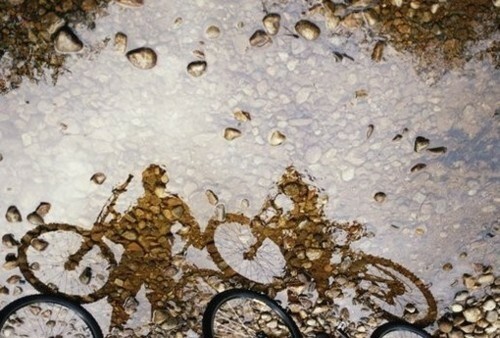 Persistent rain over a stretch of time can create potholes in the road, posing a great hazard to bike riders. Debris can also build up, along with pools of water. These should all be monitored carefully on a ride. It is advisable to research those areas that may pose a threat, so plan ahead.